Daily Whip Out: "George On His Spanish Jack"
The Father of Mules In The U.S.
"I have a prospect of introducing into this Country a very excellent race of animals also, by means of the liberality of the King of Spain. One of the Jacks which he was pleased to present to me (the other perished at sea) is about 15 hands high, his body and Limbs very large in proportion to his height; and the Mules which I have had from him appear to be extremely well formed for Service. I have likewise a Jack and two Jennets from Malta, of a very good size, which the Marquis de la Fayette sent to me. The Spanish Jack seems calculated to breed for heavy, slow draught; and the other for the Saddle or lighter carriages. "From these, altogether, I hope to secure a race of extraordinary goodness, which will stock the Country. Their longevity and cheap keeping will be circumstances much in their favor. I am convinced, from the little experiments I have made with ordinary Mules, (which perform as much labor, with vastly less feeding than horses) that those of a superior quality will be of the best cattle we can employ for the harness. "And indeed, in a few years, I intend to drive no other in my carriage: having appropriated for the sole purpose of breeding them, upwards of 20 of my best Mares". A fifteen hand jack was a big jack in 1788 and it still is today.A lot of mares that couldn't get with colt to a stallion have caught when bred to a jack.I suppose their might well be a few christian jacks in this country that are true gentleman when they breed.But for the most part don't get in the way of a 60 inch jack if he knows a mare is in season because he'll hit you like a buffalo that charged.I knew about george washington and mules.but I never read his own words about the subject.I am glad that I got to really know his opinion about them.Thank you for this tidbit that appealed to me. By the time George Washington had written this to Arthur Young (the noted British agriculturist), it was almost three years to the day that his Spanish jack, Royal Gift had arrived at Mount Vernon (December 5, 1785). He named the jack Royal Gift, and what a journey he had been subjected to. He had left Bilbao, Spain on the American ship Ranger on August 8, 1785. Arrived in Gloucester, MA. on September 26, 1785 and then was walked by his Spanish groom, Pedro Telez all the way to Boston. Upon being advised of the jack's arrival in Boston, Washington wrote explicit instructions to John Fairfax, with the man standing at his elbow, of what he should do during his travels to get the jack and Pedro. Washington wanted Fairfax to purchase two quality mares to be ridden back ponying the jack, and also planned on breeding the mares to the jack in the future. 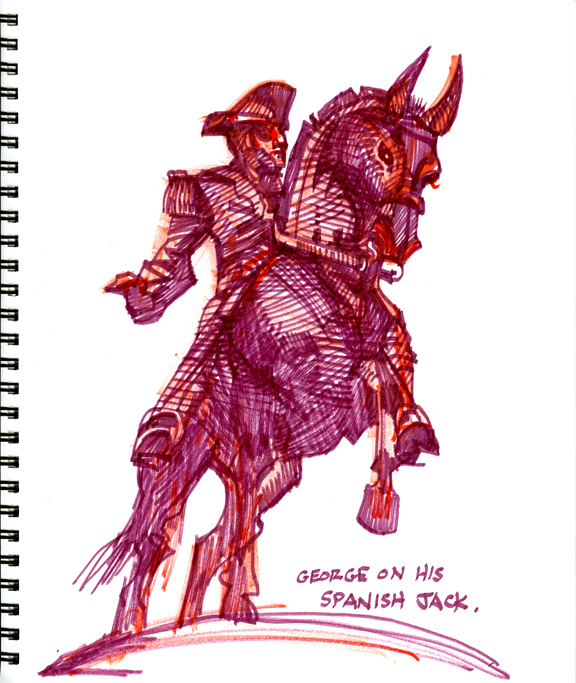 However, when Fairfax arrived in Boston, he was informed that Pedro said that the jack could only be walked in-hand, and only up to fifteen miles a day. What a sight that must have been Fairfax riding, and Pedro and Royal Gift walking all the way from Boston to Mount Vernon. George Washington, Father of the American Jackass. (Washington did buy Pedro a new pair of shoes! ).